The river got a little boost from last week's rain but that only lasted a day or two. The flows have dropped drastically again as of September 30th. Last week's report has not changed much. The Truckee continues to get lower and lower. The flows coming out of Lake Tahoe have dropped from 18 CFS two weeks ago to 8 CFS last week. It has also been cut back at Donner Lake to 38 CFS. The only kind of fishable stretch of River is in the Canyon section between Boca Bridge and the Nevada State Line where the flows are between 60-80 CFS. (Still Really Low) By the time the river gets to Mogul the flows are only 19 CFS and 55 CFS through Reno. 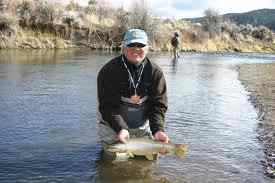 The Nevada side of the river should be avoided by fisherman at this time. These fish are already going to have a hard time making it through the fall season. It is looking more and more like we will need a few years of recovery for a sustainable trout population on the Nevada side of the river.